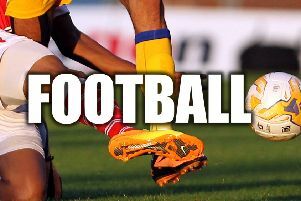 Wallington came out on the right side of a nine-goal thriller on Saturday as they ousted 10-man North Shields. Two late goals from substitutes Dan Thompson and Tom Truscott restored The Greens’ lead in a topsy-turvy encounter that also had them behind for a portion of the second half. Despite a goal for the home side with the last kick of the game, Truscott’s measured finished into the roof of the net from Kyle Reardon’s cut-back a minute earlier ultimately meant the points returned to Scot’s Gap. Even before the eye-catching scoreline, there was always going to be something unique about the match which was Wallington’s first ever competitive game played on 4G surface at John Spence High School. It didn’t take the away side long to adapt though as John Paxton raced onto Adam Whitehead’s flick-on to poke his side ahead with 10 minutes not yet on the clock. The home side have won many plaudits this season with their short, sharp passing, but, like in the reverse fixture earlier in the season, Wallington were finding chinks in their armour. Their high line was twice exploited by Paxton but some erratic finishing and good goalkeeping kept the score at 0-1. For all their neat play around the box, North Shields had still not tested Matty Lees, something that didn’t change when a mix-up in the Green midfield and defence allowed a winger to nip through and roll the ball past the stranded keeper. The lack of grass didn’t put a limit on the competitiveness or indeed the tackling, with both sides emphasising their willingness to get stuck in, which only on occasions threatened to boil over. There was no dispute five minutes before the break, however, when the Shields full-back was shown a straight red card for a kick out at Whitehead after the striker had wrestled free. The action caused a reshuffle in the home formation which Wallington and Paxton took full advantage off. Pressurising the newly-formed back-line high up the pitch, they won the ball back and Paxton lashed ,it high into the goal after Greg Reardon had slipped him through. With a goal and man advantage, The Greens emerged in the second half confident of exerting their influence on the game but in fact it was the home side who began to dictate proceedings. They laid siege to the Wallington goal which could only hold out for so long before a cross was deservedly converted for 2-2. This soon became 3-2 when a remarkable turnaround was complete with an unmarked header at the back post from a corner. It was exactly what both sides deserved for their contrasting approaches to the second period. The earlier sending off had not proved to be the turning point that Davey Featherstone had hoped for his team but one was upcoming. The home side had their lead but were still pouring forward and they were left scratching their heads at how this had not evolved into a two-goal lead. A cross from the left was caught on the volley from eight yards out which Lees, at full stretch, miraculously clawed away. This save then gained more importance five minutes later when the opposing keeper had a moment to forget as Wallington dragged themselves back into the tie. Ben Fenwick stepped forward from the back and let one of his fizzing drives canon off his foot that squirmed under the keeper’s body to restore parity once again. Thompson and Truscott replaced Whitehead and Liam Anderson as the pitch and the frantic nature of the match began to take its toll. And the two strikers, both returning after a four and one week absence respectively, showcased the team’s strength in depth with their crucial late contributions. Thompson restored The Greens lead in the game with a clever looping header from Chris Moffitt’s long free-kick for his 15th strike of the season before Truscott sealed the three points. On Wednesday, March 25, Wallington will face Whitley Bay A in the final of the NFA Northumberland Bowl at Blue Flame, Longbenton. It will be the team’s fourth final in as many years and a chance to secure a trophy that has alluded them in their long history. Come along to support The Greens. The game kicks-off at 7pm.